Click here to view historic sales data for East Colorado Springs. 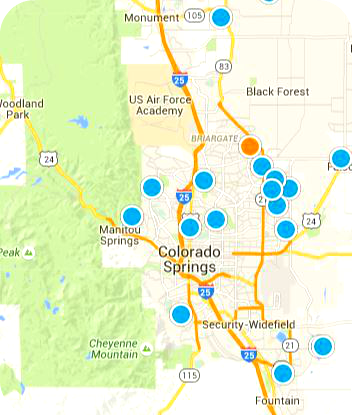 Scroll down to view the latest listings in East Colorado Springs. Situated just north of downtown and stretching from I-25 to Powers Boulevard, the eastern portion of Colorado Springs features a variety of accommodations. Everything is available, from mature neighborhoods with traditional homes to contemporary builds in newer divisions. A wealth of conveniences and the well-established community both make this area of the Springs a comfortable and desirable place to live. Some of the city's best schools, parks, and stores are just around the corner. For the outdoor enthusiast, east Colorado Springs offers an assortment of trails and open spaces embedded within the community. Over one dozen neighborhood parks complement the residential streets, including Nancy Lewis Park, Boulder Park, and the northern end of Monument Valley Park. The largest open area, though, is Palmer Park- a regional park of over 700 acres of trails, wooded areas, rock formations, a dog park, and traditional sports courts, as well. The Patty Jewett Municipal Golf Course is open to the public year-round for a very affordable green fee, while higher-end golfing is available at the Colorado Springs Country Club. Chartered in 1954, the Country Club converted a former dairy farm into a beautiful golf club complete with a full 18-hole course, tennis courts, and two swimming pools. A large selection of retailers and services have stores in east Colorado Springs, including the Citadel Mall. This indoor shopping center features a wide variety of stores, services, and restaurants. Skate City, Locked In Escapes, and Hellscream Haunted House all provided different forms of entertainment depending on the season. History buffs will enjoy the Pikes Peak Streetcar Museum or a tour of the Olympic Training Center, while music fans can catch a show at the The Black Sheep or The Flux Capacitor. Being so centrally located also means close proximity to all amenities available across the entirety of Colorado Springs. Small eateries stand beside big-name chains to offer any type of food within the neighborhood. Locally-owned restaurants include Johnny's Navajo Hogan, a roadhouse built in 1935 that still serves up drinks, pizzas, and buckets of chicken every night. Opened and managed by the same family since 1959, Roman Villa Pizza serves a mean pie and an assortment of other Italian favorites. Musashi Japanese Restaurant features the teppan-yaki style of cooking in which the chef prepares the food before the customers on top of a hibachi grill. For just a cup of coffee or a quick snack, Humble Coffee and Boonzaaijer's Dutch Bakery have some of the best pick-me-ups in town. Although students may apply for district choice to attend school in any district in the city, Colorado Springs School District 11 primarily serves the area through several noteworthy schools. Palmer High School, located between downtown and Colorado Springs, and Doherty High School are both open to students in the area, depending on the location of their home. The district received an award from the local newspaper recognizing it as one of the city's best workplaces in 2017, and specialty programs are offered for students at both Galileo School of Math and Science and at the Roy J. Wasson Alternative Academic Campus.